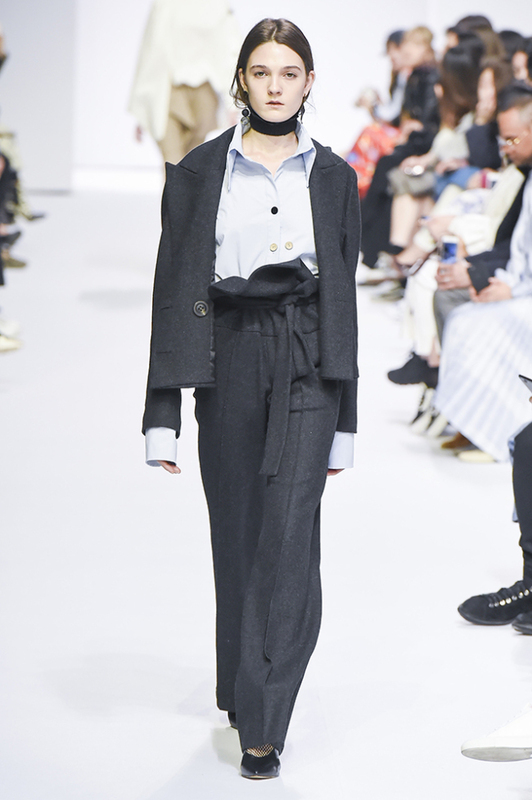 Most of us probably haven’t thought of shopping for our spring and summer wardrobes yet, but the powers that be dictating the fashion calendar insist on showing collections half a year ahead of time and voila, here are some trends for the cooler months that stood out at last week’s Seoul Fashion Week. Exaggerated sleeves were everywhere. Jinteok, the eponymous brand of iconic designer Jin Te-ok, featured long, black faux-fur sleeves on a wool checkered coat that looked as though an Afghan Hound’s legs had replaced the model’s arms. 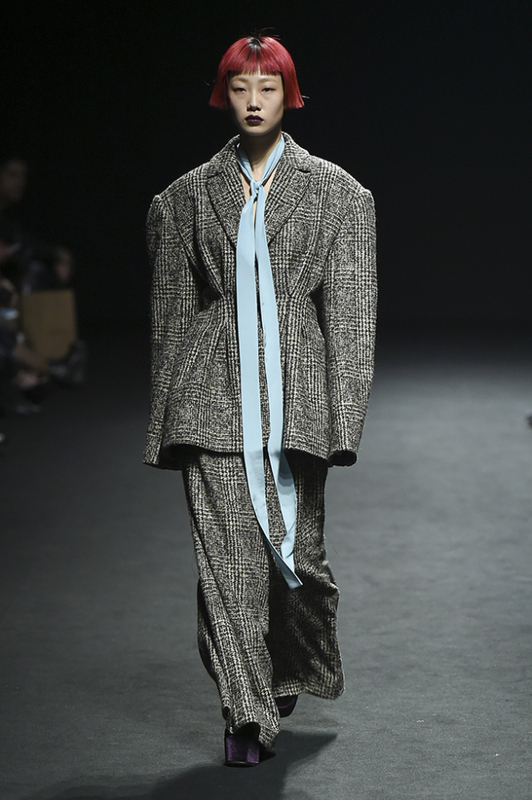 At Kumann Yoo Hye Jin, the sleeves that ran long past the hands featured zippers that ran up to the forearms, in case you actually needed to use your hands. Even short sleeves were exaggerated, ending mid-arm in a peplum, as was seen at Big Park. Designers seem hell-bent on atoning for the torture inflicted by years of skinny pants. They overcompensated with wide-leg pants paired with oversized coats. 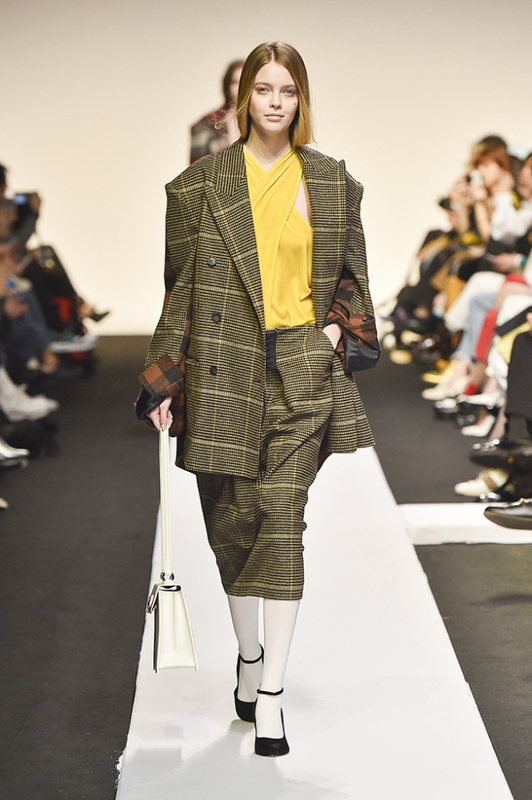 At Jinteok, the combination of wide-leg pants in plaid wool and matching cinched-at-the-waist jackets with exaggerated shoulders and sleeves struck an unexpected balance for a look that recalled the mysterious Marlene Dietrich. At many design houses, jackets were subjected to serious deconstruction. Design trio Kang Ki-ok, Crayon Lee and Coco J. Lee at Kiok created a denim and corduroy jacket, literally splicing together the left and right of the jacket in two different fabrics. Elsewhere, jackets were stripped before being reassembled. Stitches on seams were visible, emphasizing the literal deconstruction of the pieces. Trench coats are synonymous with fall and once again take a prominent place in fall/winter collections, albeit in many guises. 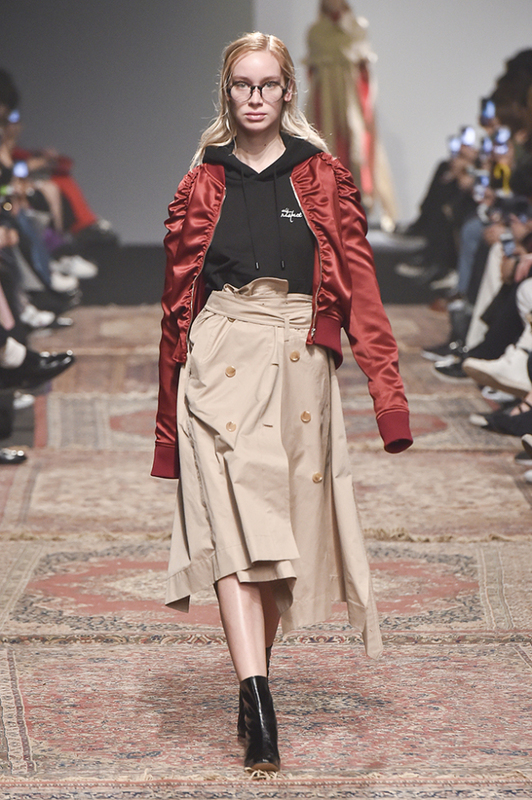 London-trained designers Choi Jin-woo and Koo Yeon-joo at J Koo serve up the classic trench coat in many variations, from an oversized, overly slouchy trench coat to a short cape and to a skirt that looks as though the top half of the coat had been cut off. 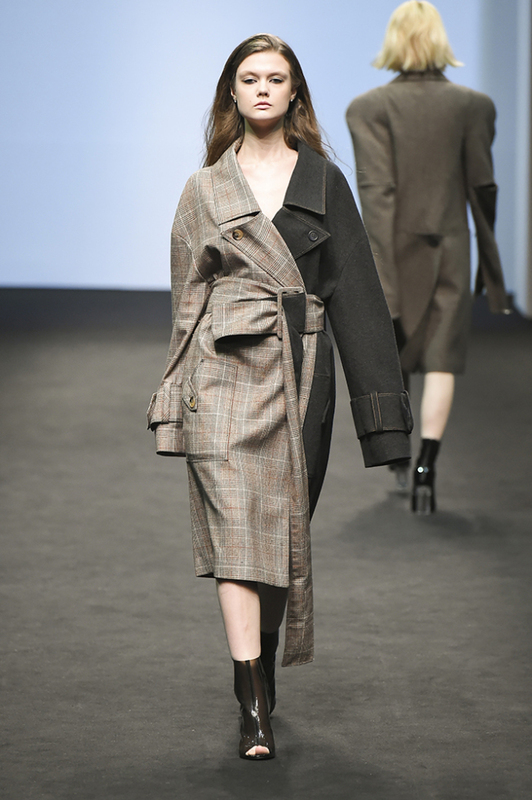 Elsewhere, trench coats were rendered in denim, looking smart with the stitching detail at Rubina, as well as in classic checkered wool fabrics. Velvet was in heavy use, in the form of the more light-handed crushed velvet. Melding crushed velvet and felt produced a contrasting pattern at Jinteok, the velvet shimmering while the felt stayed mat. Checks of all stripes were mixed and matched in a single look, sometimes in a single piece. 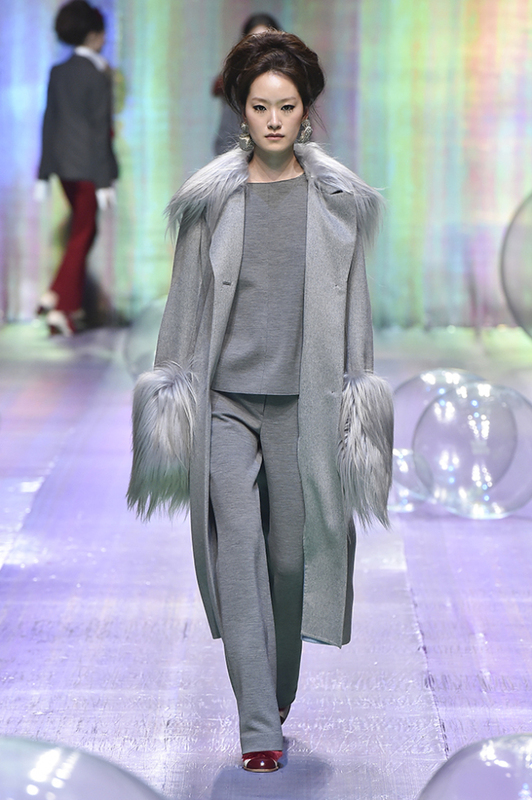 Flying about on the runways were long swathes of faux fur used to a ritzy effect in the Miss Gee Collection where Gee Chun-hee, designer to the stars, used them on collars and sleeve-ends for just the right amount of glamour.